A sheet full of emoji stickers! Finland is the first country in the world to have its own emojis!! These stickers are a collection of Finland emojis. The Finland emojis illustrate Finnish emotions and are part of the Christmas calendar published by the Ministry for Foreign Affairs on ThisisFINLAND, the country brand website. At the website there is an explanation of the meaning of these emojis. Everyone knows that Finns love coffee, Santa and sauna… but what do you know about Finnish “sisu” or the meaning of the handshake? Visit the site and find out all the fun facts behind the emojis! 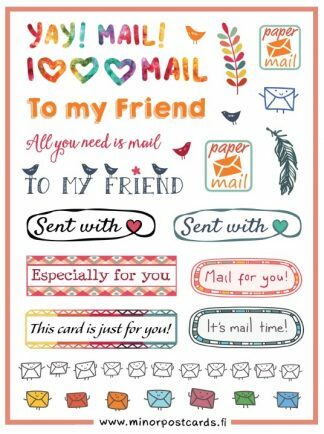 These are perfect for post cards and envelopes you send out: happy envelopes and nice texts. The cut-out stickers are printed on a nice glossy material. This small size is particularly suitable for decorating postcards. The sheet is 9,5 cm x 12,5 cm, there are 21 stickers on it.